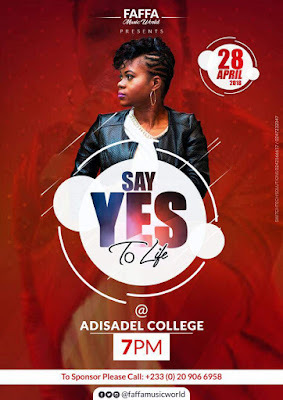 After taking the tour to Zambia on a 21 day trip in February, the backhome resumption of Faffa's "Say Yes To Life Tour" points its head to Cape Coast's Adisadel College auditorium and Faffa is ever poised to pour her Christly thrills on the Santa Clausians in an epic live band performance. Performing on the 28th April night in Cape Coast for the first time, Faffa is determined to leave a strong memorable mark for her audience to live with, just as she does wherever she stages the tour. 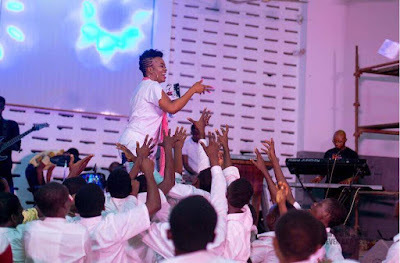 Her stop at Accra Academy last year was one of the vibrant powerful events that hit the school --- it was epic, lovely, and super entertaining. It is trusted that Adisadel will be given an equal treat, or with a possible extra that will provoke the Santa Clausians to crave multiple encores. Every fan around Cape is invited to come blend up with the Santa Clausian audience inside the school's auditorium for an exclusive "Say Yes To Life" musical concert treat. Follow Faffa, your urban contemporary gospel gem, via the below social media handles.